Kitwana Rhymer had 17 points, pulled 10 boards to go with four blocks and Jevaughn Cameron added 16 points, seven assists and six rebounds, in helping Momentum upset defending champions Splash Brothers, 81-67, in the opener of the Hon. 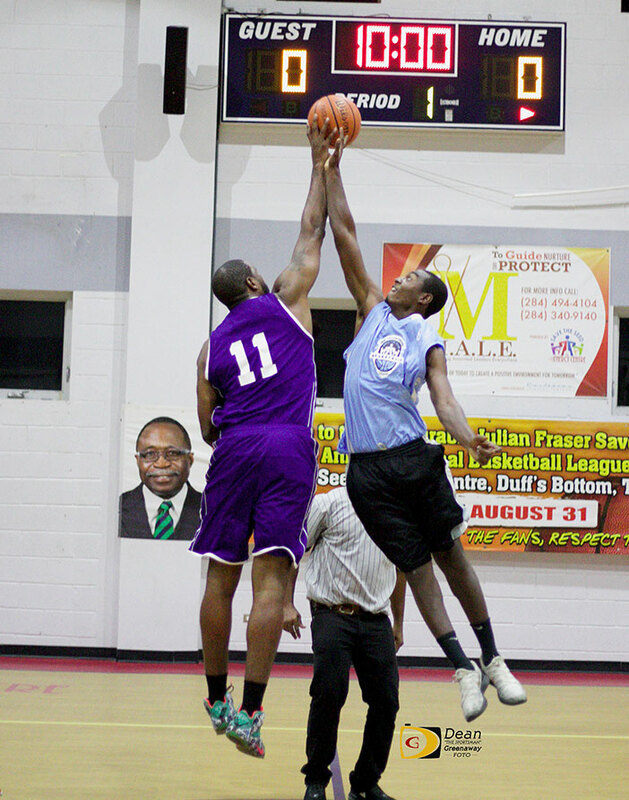 Julian Fraser Save The Seed Basketball League on Saturdaynight in Duffs Bottom. Radley Stevens added another 13 points and seven rebounds to the tally. Shaheed Collins was Splash Brothers’ leading scorer with 15 points. He also had five assists and four rebounds. Jasin Rhymer and Steve Parillon chipped in 11 points each, while Deangelo Samson contributed another 10. After beating We Dem Boys 100-70 on Saturday night, Bayside Blazers fell to the Knights, 69-66 on Sunday. Jamal Serrant had a game high 20 points in leading the Knights. He also had six rebounds and four steals. Nicols Charles finished with 16 points and Lyle Duggins, 10. Cedrick King pulled 14 off the rack to go with his four points, four steals, four assists and three blocks. Dion Blyden’s 12 points was the top scorer for Bayside Blazers. He also had eight rebounds. Stephon Caul narrowly missed a double double with his 11 points and nine boards. Tavon Phillip dropped in 10 points and pulled 10 off the rack and also had four steals. Anthony Keane was chairman of the boards with a game high 13 rebounds, to go with his eight points and four steals. Da 3rd bounced back from Friday night’s 93-86 loss to Young Empire, led by Heston Charles’ 28 points and Drexton Guton’s 20, by fending off Warrias, 79-78 on Sunday. Jamiez Stoutt—who had 22 in the loss to Young Empire—was their top scorer with 16 points, eight rebounds and five assists. Lestin Wiltshire—who also had 22 during the loss—followed up with 15. Vincent Wattley dropped in 14 points and 10 rebounds with Phillip Glasgow pouring in another 11 points, 11 rebounds, six assists and five steals to the stat sheet. Nat Malone and Juan Richards were the Warrias leading scorers with 15 points each. Richards pulled down a game high 14 rebounds. Ryan Alfred narrowly missed a coveted double double with 14 points and nine rebounds, while Noel McKelly added another 11 points to the score sheet. T’Quan Bodkin had 13 points in leading High Speed to a 30-20 victory over the East Cavaliers in Jr. Division play. Kimmoy Caines finished with eight points. Lemar Jackson was the East Cavaliers top scorer with six points, six rebounds and four steals. 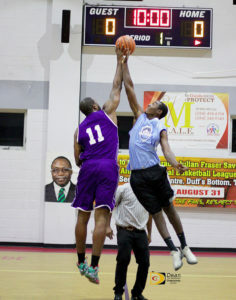 The other Jr. Division matchup saw Jr. Bayside Blazers rolling past Best Mode, 49-39. Stephano Paul led Jr. Bayside Blazers with 14 points and Jiliani Leonard added 13. Kymal Pancho led Best Mode with a game high 15 points.